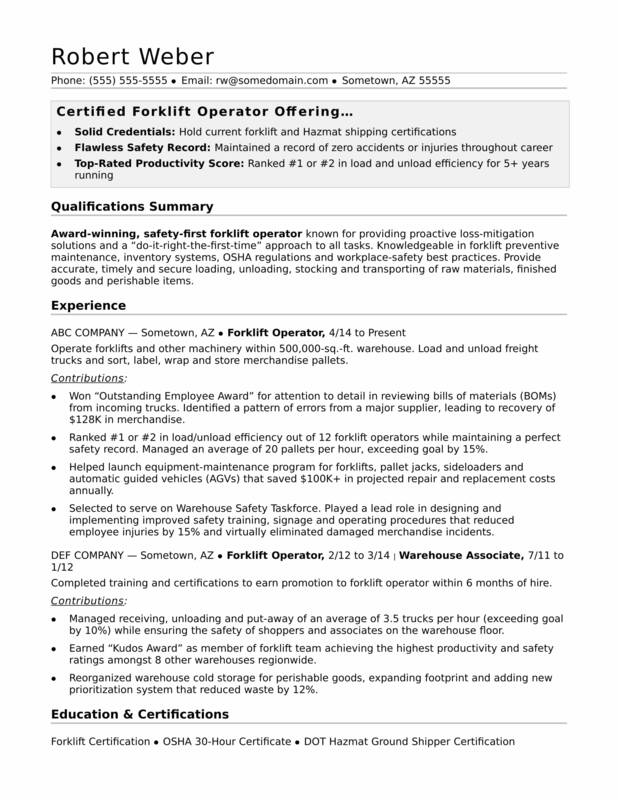 View this sample resume for a forklift operator, or download the forklift operator resume template in Word. Could your career use a lift? To be considered for top forklift operator jobs, resume expert Kim Isaacs says it helps to have a comprehensive resume. For resume writing tips, view this sample resume for a forklift operator that Isaacs created below, or download the forklift operator resume template in Word. And if you need more help, get a free resume evaluation today from the experts at Monster's Resume Writing Service. Jobs for material moving machine operators are projected to grow by 6% (or 43,700 jobs) from 2016 through 2026, according to the Bureau of Labor Statistics (BLS). You'll find the highest level of employment for this job in the following states: Texas, California, Georgia, Pennsylvania, and Ohio; and in the following metropolitan areas: Atlanta; Dallas; Houston; Riverside, CA; and New York City. As a forklift operator, you can expect to earn a median wage of $34,830 per year, or $16.75 per hour, according to the BLS. Additionally, you can search for forklift operator jobs on Monster. Award-winning, safety-first forklift operator known for providing proactive loss-mitigation solutions and a “do-it-right-the-first-time” approach to all tasks. Knowledgeable in forklift preventive maintenance, inventory systems, OSHA regulations and workplace-safety best practices. Provide accurate, timely and secure loading, unloading, stocking and transporting of raw materials, finished goods and perishable items. Operate forklifts and other machinery within 500,000-sq.-ft. warehouse. Load and unload freight trucks and sort, label, wrap and store merchandise pallets. Won “Outstanding Employee Award” for attention to detail in reviewing bills of materials (BOMs) from incoming trucks. Identified a pattern of errors from a major supplier, leading to recovery of $128K in merchandise. Ranked #1 or #2 in load/unload efficiency out of 12 forklift operators while maintaining a perfect safety record. Managed an average of 20 pallets per hour, exceeding goal by 15%. Helped launch equipment-maintenance program for forklifts, pallet jacks, sideloaders and automatic guided vehicles (AGVs) that saved $100K+ in projected repair and replacement costs annually. Selected to serve on Warehouse Safety Taskforce. Played a lead role in designing and implementing improved safety training, signage and operating procedures that reduced employee injuries by 15% and virtually eliminated damaged merchandise incidents. Completed training and certifications to earn promotion to forklift operator within 6 months of hire. Managed receiving, unloading and put-away of an average of 3.5 trucks per hour (exceeding goal by 10%) while ensuring the safety of shoppers and associates on the warehouse floor. Earned “Kudos Award” as member of forklift team achieving the highest productivity and safety ratings amongst 8 other warehouses regionwide. Reorganized warehouse cold storage for perishable goods, expanding footprint and adding new prioritization system that reduced waste by 12%.